Over the years I’ve tried variations of ‘mom school’, but for the most part let it go by the wayside when he started 1st grade over a year ago. Too much school work and way too many activities. But, well, mom school was never really about hard learning. It was more for fun time spent learning together – usually both of us. I like teaching and connecting and learning with my son and decided to bring back mom school. In December (when we had time) we did 5-10 minutes learning about kids who did amazing things and it was fun. But with the new year we started something with a little more stretch. We are spending 5-15 minutes a day to study each President in order. The first four are pretty easy since big things were happening. I don’t know how it will hold up over the next 41 (and the 45th? it will take all of the diplomacy this Libra possesses). So, my goal was to read a book and then choose one thing that we could do. Jason and I visited Mount Vernon last month and I picked up a book of paper dolls. It took me more time to cut out George and his stepson and all of their clothes than we actually used them, so not sure that was a win for me, but they are cool. For John Adams we had a 10 minute drawing contest to see who could draw the best picture of the first White House and then we called Jason in to see who did the best. I was robbed. For Thomas Jefferson we read through the two picture books shown Thomas Jefferson Grows a Nation and Worst of Friends and then Gage traced from a photo America before Jefferson was President and after the Louisiana Purchase to see what a big deal it was. James Madison’s book was okay and after we learned that the White House burned to the ground in 1812 Gage went to work burning down the White House he drew two days earlier, lol. We also watched a video on the story behind the Star Spangled Banner. So, as you can see, we aren’t doing anything mentally strenuous here, but it’s nice that we can spend a few minutes together each day reinforcing that knowledge and learning are important. I want him to remember that learning can be fun and so can his mom (when she wants to be ;)). Sundays With Gage – It’s so cold and a winner! Jennifer T!!! I’ll send you an email or you can beat me to it and email me your address. On the Gage front this week, he went back to school from winter break on Tuesday. Friday they cancelled school because of an ice storm. Tomorrow is Martin Luther King Jr. Day so no school. Tuesday he’ll go back (although we’re getting snow tomorrow night so who knows). In the last month he’ll have had three days of school. Three. Days. I love my kid. He and his dad are my world, but everyone needs to go back to their schedules (Jason has used a lot of vacation time in the last month). It is so cold and icy and snowy that finding entertainment is challenging. We’ve already been really sick this winter, so I’m trying to avoid the popular kid sick-infested areas, but Gage requested one tomorrow. We’ll see if I can keep my sanity and him healthy another day. Wish me luck! As an only child, married to an only child, who has an only child, the house sometimes feels too quiet and too calm. I often worry that Gage will become too serious like his parents. There are lots of benefits to being an only, but the lonely feeling is not one of them. It’s why I appreciated growing up so close to aunts, uncles, cousins and grandparents. And now I’m thankful to share that same wonderful family with Gage, even if we are far away. My nine cousins on that side of the family are all within 15 years of each other and kids came in a timely fashion to most, but not me. Gage is closest in age to Lucy and she just got her driver’s permit! But, when family is together all is good and Gage loves feeling like part of a big family. Amy and I are only 5 months apart and even spent our freshman year at Ohio State as roommates. Her son is a junior in college and a great kid. Here he is playing Gage in a game of chess at Thanksgiving. See Gage surrounded by all the love? It makes this ‘only’ mama’s heart happy. Gage is great with numbers, he plays chess, he can play Old MacDonald on the piano, he shows no fear when he should, he can tell you about all of the planets, space and black holes. But until this summer reading wasn’t coming along and it caused him a lot of frustration. In June, he started going to the local Kumon tutor center once a week for 30 minutes and did about 10 minutes of daily homework and slowly, but surely progress is being made. It’s a relief to me, but we have a long way to go. It’s hard for him when something is just too challenging because he really does want to do everything well, so I am trying very hard to go slow and just give him some confidence. So, the day that I started my new 30 Day Challenge I asked him if he wanted to finally join me in his first 30 day challenge. He was so happy that I asked and said yes right away. So, he is reading a new book every day this month and so am I. He gets to choose the easiest books because I just want him to stay excited and I look forward to seeing him willing to read every day! Please hop over to my 30 Day Challenges Blog to follow along. So far, Gage has read 3 Bob Books. Not very exciting, but it is really helping his reading aloud fluency. Sundays with Gage – Martin Luther King Jr.
One of the picture books in Gage’s Christmas advent tree was Martin’s Big Words:The Life of Dr. Martin Luther King, Jr. written by Doreen Rappaport and illustrated by Bryan Collier. It is a gorgeous book, this picture of the cover doesn’t do it justice. It’s oversized and has won many well-deserved awards. Jason read the book to Gage (now 6-still can’t believe it) first and I remember Gage asking a lot of questions about him getting killed at the end. Not a lot of books prepare a child for this sort of ending. The second time I sat down to read it with him a few days ago and before we even sat down he was telling me how King did good things. I told him yes, Martin Luther King changed the world (something we talk about often with different people) and even before I got the book opened he asked me, “How old was he when he knew?” “Knew what?” “That he wanted to change the world.” My heart melted. It is never too early to talk to kids about grand ideas or big dreams! We find out in the book that the seeds were planted when he was Gage’s age. 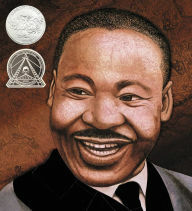 A beautiful book and starting place for young kids to learn about a civil rights icon. It led to great questions and a real interest to learn more. For both of us. Last year Veena posted an advent idea for kids and I made one for Gage and he loved it. I put this year’s together in about 3-4 hours. Starting at the top he opens a book everyday, including Christmas starting December 1. There are small stickers on each one with the number. Step 1-Spend and hour and a half at the bookstore browsing and then purchasing 25 books OR visit your library and check out 25 special books and do it that way. The kids only care about opening the books and reading them. The keeping them is secondary. You could always offer to buy them their favorite one after they’d read them all. Since I bought these I went with the sales, buy two Little Golden books get one free, etc…Last year I bought too many Christmas books so I tried to only buy a few this time. I want them to be read all year round. Step 2-Buy one of those 3 packs of wrapping paper at a discount store and alternate. I did stack these by size so the wrapping went quicker and I could put the number stickers on right away. Step 3 -Turn the wrapped books so that it resembles a tree. Place some lights around it and a pretty new ornament on top and you’re done. Do you remember learning to read? I sure don’t, although this isn’t really a huge surprise since I don’t have a lot of memories from my kindergarten years. I don’t think it’s until I was in the third grade that I have a lot of real memories. As a mom who loves to read I’ve been stressing out. Gage has known his letters since he was about 18 months and had a lot of sight words before Pre-K. But reading? Not so much. Even sounding out words is frustrating for him. Memorizing words not a big problem but when you can’t sound them out and he has so many he can get easily confused. Since kindergarten started he has made great strides. Still a struggle, but not nearly as frustrating. We were doing a workbook today and I realize just how many more words he knows and how he is finally understanding the process of sounding out a word. When I went to the parent teacher conference they said he was at 1.5 level math (1st grade, 5th month) but in reading the test is a little different and he’s in the probable reader classification. Kids on the spectrum can be just as smart as the next kid, but sometimes learning needs to be done in a different way and usually one on one. I gave up Gage’s one on one tutoring over the summer and even that was only 2 hours a week for the previous year. So, for now, I wait patiently. And hope that there is such a thing as a reading gene and that it kicks in soon. Yes, I realize that sounded less than patient. I’m trying!